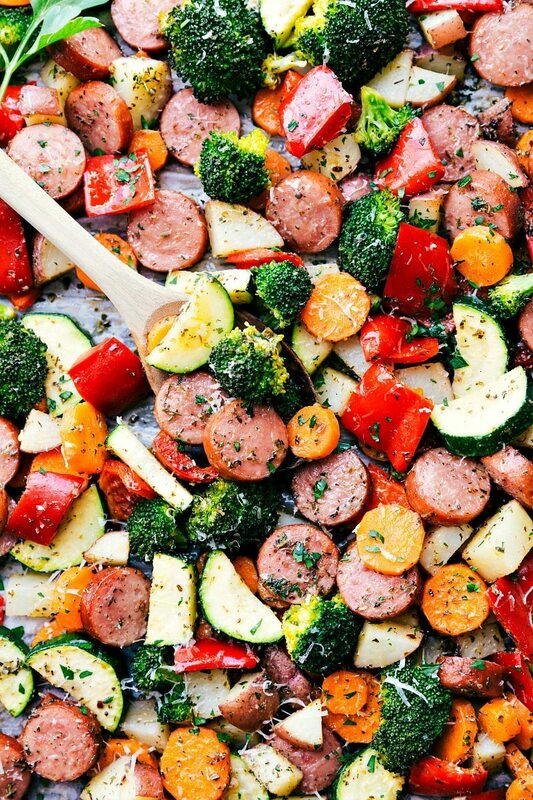 Delicious Italian-seasoned veggies and sausage all made in one pan. A healthy meal prep option! My toddler goes to preschool two times a week and when he comes home he’s super chatty about what they did that day. He talks a ton about his friends and one girly friend in particular. He tells me she’s “so much nice” and that he “loves playing trains with her.” She’s added into discussions about our family and yes, my toddler even prays about her sometimes. After I told her that, No, I’m Greyson’s mom, I watched the slow nod of an obvious lack of knowledge of a boy named Greyson. And so, although he didn’t know it, this meal was made specifically for him to combat his first real heart break. ? (Yes, I am 100% kidding here). All of his favorite veggies and his very favorite meat — sausage. He loves turkey sausage — in fact it’s really the only meat I can get him to eat. And he literally steals the broccoli from my plate he loves it so much. This dish is so quick and easy to make and the veggie prep is fast! You can easily customize this dish by adding in your favorite veggies. You can also use whatever sausage you like best. We’ve made this with Italian Chicken sausage and love that. If you can’t find an Italian flavored sausage, regular turkey sausage is still amazing with all the seasonings. Use a LARGE sheet pan: the more space the vegetables have (aka the less crowded they are) the better they roast. When vegetables are overlapping or jammed into a sheet pan, they end up steaming instead of roasting which greatly affects the end taste/texture. I’ve started using this 15×21 inch sheet pan – which is practically the width of my oven. I can’t recommend the large sheet pan enough! Preheat the oven to 400 degrees F. Line a large sheet pan with parchment paper or foil (easy clean-up) and set aside. Halve the zucchini and then cut *thick* coins of zucchini. Coarsely chop the broccoli. Remove the stems and seeds from the peppers and chop into medium-sized pieces. Chop the sausage into thick coins. In a small bowl combine all of the seasonings and salt and pepper if desired (I use about 1/8 teaspoon pepper and 1/2 teaspoon salt) with the olive oil. Stir to combine. Pour the seasoning & oil mixture on top of the veggies and sausage and thoroughly toss to coat. Place in the heated oven for 15 minutes. Remove and toss around the veggies + sausage and return to the oven for another 10-20 minutes or until veggies are crisp tender. Remove and top, if desired, with freshly grated Parmesan cheese and fresh parsley. Aww that’s such a cute heartbreak!! 😛 Kids are the best!! This for sure looks so flavorful and that pic with rice underneath totally made me hungry! Do you have to cook the sausages before mixing them with the vegetables? So happy you’ve enjoyed this dish Sarah!! Thank you so much for the comment 🙂 And great idea to use a Ziploc to toss it all! Sounds like a plan using a bag! Is the sausage pre-cooked? Or does it cook in the oven with the veggies. THANKS! Smoked sausage is really already cooked so when you add it to the veggies, you’re just heating it through! This turned out extremely well, and is so adaptable! I used turkey sausage and made enough to fill two sheet pans. It made meals for days! Initially I decided to eat it with cous cous, but ended up preferring it on its own. Thanks so much for this great recipe. This recipe looks delicious, and easy! I would appreciate, though, any suggestion(s) on what to use in place of the broccoli. I hate broccoli. This turned out great for me! I used frozen baby brussel sprouts instead of broccoli just because I already had them. (I steamed them a couple minutes in the microwave while I was cutting up the other vegetables and they roasted perfectly.) I also used Tofurky Kielbasa for my sausage. The results were delicious- this is definitely in the rotation from now on. Thanks for the terrific recipe! Made this tonight and served it over quinoa, it was fantastic! Going into the rotation. So happy this makes it into the rotation 🙂 Thank you for the comment! I’d recommend green beans if you like those! 🙂 Hope you enjoy! How would you measure this out using the 21 day fix containers? I’m new to meal prepping. But this looks amazing! I’m sorry, I’m not familiar enough with the 21 day fix to give measuring recommendations. Wish I could be of more help! Do you think I could add grape tomatoes to this? Or would they cook too fast compared to the rest of it? Do you use uncooked or precooked sausage? Looks delicious! I made this for my work week. It work out awesome. The only change I made was I added minced garlic. Still tasted awesome. Any idea on how many weight watchers points it is? I’m sorry, I’m not familiar enough with Weight watchers to know the points; hopefully someone else can chime in here! I take recipe headlines with a grain of salt…some are fine, some are okay, some not so great. However, I think this one is truly delicious and is definitely a keeper. I’m not much of a salt person so probably will skip that next time as the pre-cooked chicken sausage was salty enough. Yum and simple! Would this freeze ok? I’m interested in doing all of the prep pretty much up to cooking, and instead freezing. Not sure how the veggies would come out though? I’ve never tried freezing this dish so I really can’t say. I doubt the veggies would be as crisp tender after being frozen, but I could be wrong! Just tried this recipe today, and I can definitely say I’ll use it again! It’s a quick and easy way to get in fresh veggies! Thanks for sharing! This was really delicious! I pre-chopped all of the veggies and only had to add the potatoes and sausage before roasting. Served it with brown rice. Hubby loved it, too! Will definitely make again. You mentioned in a comment far below that you use precooked sausage – if I’m planning on using uncooked, would I just cook it first and then add it in to the pan when you say to? What sausage do you have that you want to use? It could probably still cook through in the time depending on what you are using and the size. I’m wondering the same thing. I’m using freshly ground italian chicken sausage from a deli. Should I cook it first? You are welcome! Glad you enjoyed this dish!! I made this last night and it was delicious! My 10 year old son loved it. I did brown the turkey sausage just a bit on the stove before I cut them up and put them in the pan with the veggies. 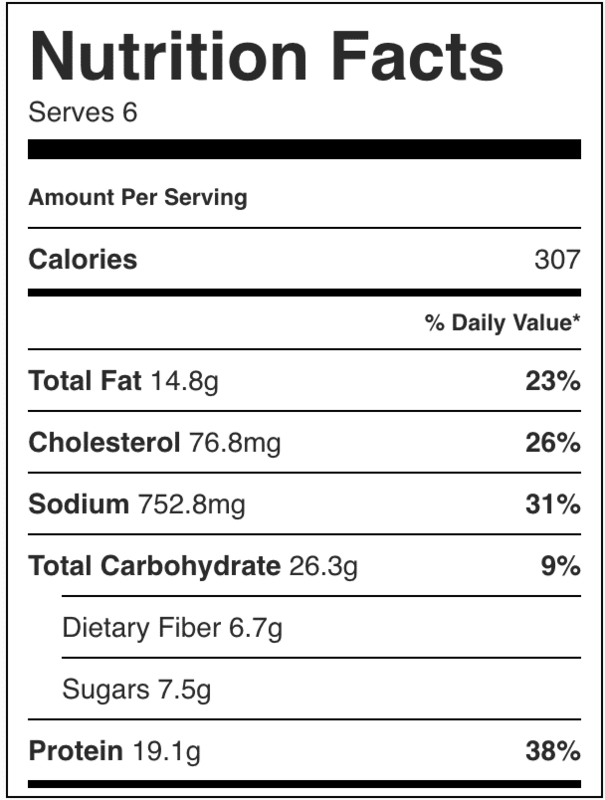 Also does the calories listed include calories for the rice, and if you can put the saturated fat on here I could manually add this to my foods on my weight watchers tracker. This also was great for leftovers and to pack for lunch. I’m so happy you enjoyed this!! The nutrition label does not include the rice 🙂 Also, unfortunately, I don’t have a way (yet) to add a saturated fat breakdown on my labels. This was so delicious!! I made it on Sunday for my meal-prepped lunches for the week and added some veggie pasta with it instead of rice. So so yummy, I loved it everyday and kept me so full! How did you reheat it? I am making ahead to take to someone and wondering if I should use the oven to reheat or the microwave. Oh my heart!!! That is so sweet (and funny). My toddler too comes home from preschool and loves to talk all about the sandbox and his buddy “Jack”. I’m not even sure Jack is a real kid, but I’m hoping so! I make something similar like this in a big pan over the stove but throwing it all in the oven is genius. I have to try your version asap! To be frank I never thought that we can make a sausage in that way as well. I am surely gonna try it at home. Totally a sausage lover too! Haha, I hope you love it! Do you think this will also come out just as good in a toaster oven? Loved it! Had to take the red peppers out because my husband is a picky eater. But it was really yummy! I made this for the second time tonight and it was a hit once again. Even my picky eaters end up having seconds! We like it over quinoa (cooked in chicken broth.) Thanks for the great recipe! This was absolutely delicious. I plan to try all your other recipes! I’d toss the shrimp in seasoning, but add it later so it’s not overcooked. Depending on the size of the shrimp it only will need 8-10 minutes cooking time. Second time cooking in my whole life! My fiancé loves tooo cook, so I never get a chance too! I saw this recipe and I thought I would cook for him! It was an easy recipe and it tasted soooo good!! So glad I was able to cook this time ? After seeing the comments I will use the ziploc bag technique! So happy this dish was enjoyed! 🙂 Thanks for the comment! How many ounces in a serving? I’m not sure on the ounces; sorry! For the person who asked about Weight Watchers smart points – this recipe (with 4 1/2 tablespoons of oil) is 9 smart points when figured with 6 servings. I’m so sorry Amy! I have some people looking into it and in the meantime, if you copy and paste the recipe into a word document, you can print it without the commentary and pictures. Thank you for your patience while I worked to get it fixed. Three out of four of my kids can be picky, but I have made this several times with great results. I made it again last night and even my two year old was scarfing it down. Thank you for such a great recipe and for detailing how big to cut everything. Do you think it would be good with substituted veggies? I want to substitute green beans for broccoli and mushrooms for carrots and skip potatoes since it is going over rice. Do you think this combo would work well? Sure! I might add in the mushrooms a little later since I think they’d bake faster. Enjoy! Made this and served it over Quinoa. It is awesome. Loved the blend of flavors. I now make it regularly using Polska Kielbasa sausage and have tried it with white sweet potatoes and have subbed in yellow summer squash instead of zucchini but it is great with any combo of meat and veggies. My kiddos love it so much that I now double the sausage and we have plenty for leftovers for lunch the next day. Thanks for sharing. So happy to hear you’re enjoying this dinner! 🙂 Thanks for the comment Jane! This is one of 7 meals I feature on my blog as being a great, healthy and easy meal for families. We are going to try it tonight!! Can’t wait, looks so yummy! Thank you for the feature 🙂 I hope you love this meal! We’ve made this at least half a dozen times in the last 4 months! We add shrimp to ours too and use jalapeño sausage (?? Texans) it’s so easy and delicious!! This recipe is so simple and flavorful. I have made it a few time and it’s always a hit. The only thing I’d change is to not add basil, I’m not a fan other that that it’s get a TEN!! This recipe has been a Godsend and I’ve made it every week since I pinned it a few months ago. We leave out the potatoes and I will sometimes have brown rice to keep the carb count lower. It’s easy, quick, flavorful and leaves enough for leftovers. It also gives me a break from all of the bacon and ground beef the Hubs insists on eating! Thanks again! The whole family loved it! I usually don’t add this many tablespoons of spices to my veggies, but it totally worked. I appreciate all of the tips on how big to cut each vegetable. Thanks! This recipe’s in the regular rotation from now on. 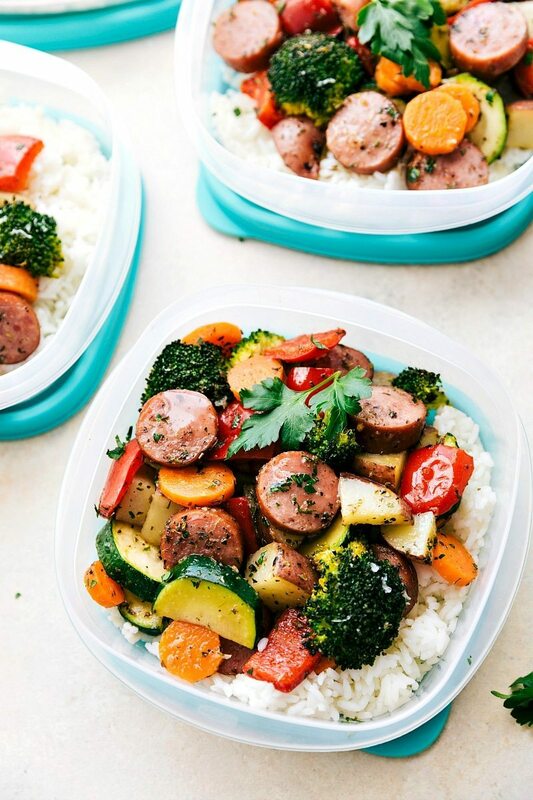 This one pan healthy italian sausage and veggies recipe looks absolutely fantastic. Beautiful photos, too. I look forward to trying this. Thx for sharing Chelsea! is Polish Kielbasa a precooked sausage when bought,or should I cook it first before adding it too the veggies in your recipe.? I made this last night for my family and they loved it! Even my 15 year old stepson liked it (he’s an exceptionally amazing stepson but can be a little picky)! We always ask “the question” to see if a new recipe is good or not. I ask “can I make it again?” And the answer was a definite YES! I used a steakhouse seasoning blend instead of Italian seasoning and omitted the salt and garlic since the blend I used already had both. It was so good and I felt that my family was getting something good for them. 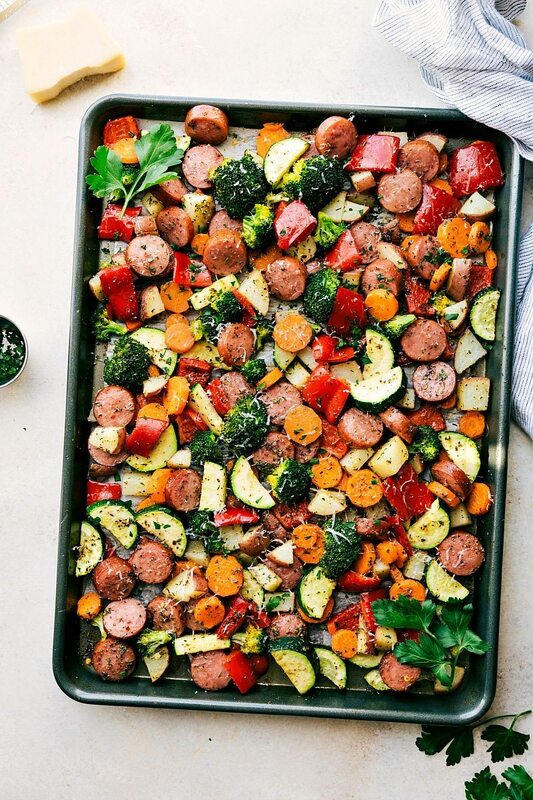 Do you need to steam/pre-cook the veggies and potatoes before throwing them all into the oven with the sausage? What a terrific dish! Paired with a nice salad this was a big hit with hubby. I used fresh herbs in place of the dried because I have them in my garden along with minced garlic and organic Hot Italian Chicken sausage. Yummy! Thanks for sharing! So happy to hear you enjoyed this dish! 🙂 Thanks for the comment Paulette! I have tried this recipe three or four times now and it is PERFECT for my husband and I. It has everything you could want in a meal and the seasonings are so good! I’ve changed up the veggies too – it truly is one of my favorite meals to make! So happy to hear that! 🙂 Thanks for the comment Emily! I very rarely leave replies to recipes, but I had to let you know how much my family ABSOLUTELY LOVES this meal!!! I’ve made it over 3 dozens times after I pinned it on pintrest, and each time it has come out FANTASTIC! I sent this recipe to my neighbor and she uses it just as frequently as I do. We’ve made it with a wide variety of veggies and each time it comes out great. Thanks for sharing this recipe!!! I’m so thrilled to get your comment and happy this has been a hit! 🙂 Thanks so much for taking the time to leave your review Rachel! Tried this recipe last night after seeing it on pinterest last week! The recipe is delicious and was worth the effort but it took wayy longer than 15 minutes to prep, closer to 35 for me. Plus it made so much that I had to make it in two batches because it was overflowing in the large sheet pan I used. Other than those two things, I highly recommend this recipe! We make this recipe at least once a week. It is my husbands favorite! We add portobellos! So yummy! And it makes great left overs. This has a great amount of flavor! I have made it several times and love it each time! Could this be prepped and frozen to be cooked later or would the vegetables become mushy? Hmm I haven’t ever tried that, but I think the veggies might end up mushy/soggy. Wish I could be of more help. Can this be made as a meal prep lunch? The directions don’t say anything about storing it even though the title indicates that possibly. Wow! 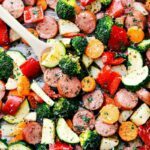 Thisone pan healthy italian sausage and veggies recipe is incredible! I’m seriously so inspired right now! I wanted to thank you for this AMAZING recipe! So simple and flavorful. I’ve been cooking low carb dinners for 2 months and this is the only one my husband has actually liked. This was absolutely fantastic! I added some freshly chopped garlic just because I love the taste and my family devoured it. I’m not usually a sausage fan but this was SO good! Can’t wait to make it again! I appreciate the directions on how to cook the veggies so they cook (mostly) evenly! I’m going to try this with vegetarian sausage since I don’t eat meat, but I bet it will turn out great. Curious if you’ve ever used chicken. The adults in the house love the sausage and this recipe but the kids are not fans! Your recipe is truly amazing! I made this for my boyfriend and his family and they absolutely loved it. Thank you so much! I can’t wait to try your other ones. I made 2 big pans of this the first time I made it. I thought I had made way too much, but, we devoured it in just 2 days! I’m making it again tomorrow…can’t wait. It’s so easy and delicious. Thanks, for the recipe! I’m so happy to hear this! 🙂 I hope you guys continue to enjoy! I found this recipe some time last year and have made it regularly ever since. It is one of my favorite dinners! I am going to try and make this a freezer meal as I am due for my second in a couple weeks. I’ll let you know how it goes. I love this, thank you so much for sharing! I made this on Sunday and am now eating it for the 3rd day in a row and it’s still delicious! I really appreciate you including detailed instructions on how to cut everything so it cooks evenly because that is usually my downfall! Omg this was delicious. So easy to make and it made two baking pans worth for me and my fiance. We were eating it cold the next day it was so good! Next time I think I’ll add brussel sprouts. Definitely 5 stars as is though! This may be a silly question but is the calorie count per serving or for the whole pan? I love this recipe! The seasoning makes the vegetables so yummy and flavorful. My family loves it, and I cook the sausage separately just because I don’t like my vegetables too soft, but still amazing! Love this recipe! Replaced Bell Peppers with mushrooms, and they cooked perfectly. I was wondering if you had a fridge life in mind? Is five days reasonable? Thank you so much for this recipe! I have made it two nights in a row for extra meal prep and my husband and I LOVE it! So fragrant and flavorful and really encourages us to eat more vegetables. A small side of brown rice and it’s such a complete satisfying meal. I accidentally added the parmesan into the sauce mixture, will it still cook/taste the same or should I toss the sauce and remake it? Great recipe! I used frozen broccoli since we had some in the freezer but all other veggies were fresh. With the frozen, I nuked them for a few minutes and patted them dry. I also used baby carrots since that is what we had as well. This definitely makes a lot and my husband is taking leftovers for lunch tomorrow so a win in my book! Amazing! this recipe has been a Godsend and I’ve made it every week since I pinned it a few months ago. We leave out the potatoes and I will sometimes have brown rice to keep the carb count lower. It’s easy, quick, flavorful and leaves enough for leftovers. It also gives me a break from all of the bacon and ground beef the Hubs insists on eating! I love this recipe!Def a new fave. Easy, filling, & so yummy! They’re so colorful! I’ll be making these for my lil sister’s birthday party. I absolutely loved this recipe. Big hit with the fam. I will be making again! I accidentally used uncooked turkey sausage instead of smoked, will it still cook in the 35 minute time frame? Looks delicious! If I want to use frozen veggies instead.. should I let them defrost or put in the microwave before adding the seasoning? If so, how long? I’d let them fully defrost first! Also dry them out as much as possible! Great idea! I will definitely be making it soon! Soo yummy!! I also added some yellow squash with mine and it was delicious! Served it with brown rice. Thanks Chelsea! 🙂 I love how it gets me eating my veggies too! This was yummy! Made it last night and everyone (4 kids, hubs) went for seconds. The kids asked me to make it again tonight and this time we’re gonna sub broccoli and zucchini for the bell peppers and carrots. Thanks for posting!